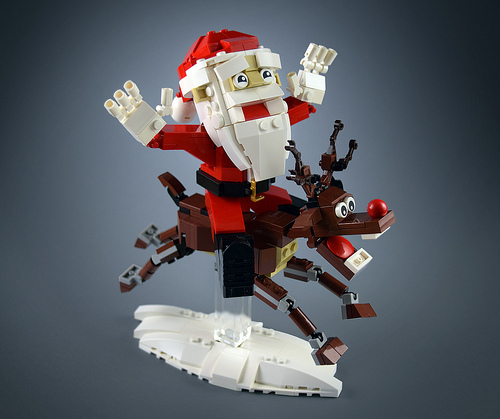 No sleigh required here — aido k‘s LEGO Santa Claus seems quite happy taking a ride directly on Rudolph’s back. This is a fun model, with printed eyes giving Santa’s face a whole heap of character, and nice use of Mixel joints to provide dynamic posing for the dashing reindeer. Santa’s gloves are excellent, and I love Rudolph’s nose and antlers. The white base is a smart touch, giving just enough context to the model, and suggesting a bouncing boisterous progress across the snow.